"You'll see this type of potato salad on most Israeli tables. In Israel, it is called 'Mayonnaise Salad.'" Place the potatoes into a large pot and cover with salted water. Bring to a boil over high heat, then reduce heat to medium-low, cover, and simmer until tender, about 20 minutes. Drain and allow to steam dry for a minute or two. Finely chop the hard-cooked eggs and the pickles. When they're cool enough to handle, cube the potatoes and transfer them to a 9x13-inch dish. 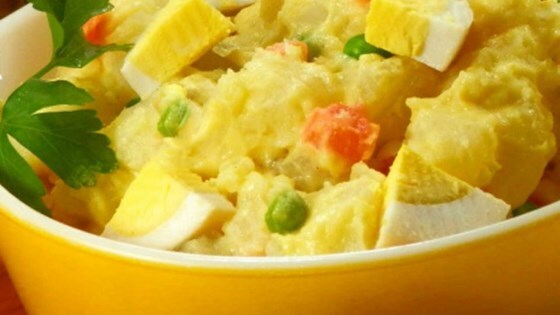 Stir in the chopped eggs, pickles, mayonnaise, mustard, and the peas and carrots and mix gently to combine. Season to taste with salt and pepper. Serve immediately, or refrigerate the salad before serving. Israeli-style pickles are brined in saltwater rather than a vinegar solution, and are made with small finger-sized cucumbers. Love this! It's great alternative to regular ol' potato salad. And being I've never been a fan of celery, like that this still has the crunch from the pickles. Yummy stuff!